The video clips aren’t subbed yet. The controversy surrounding JYJ Junsu’s tweets to TVXQ’s Yunho has drawn in many opinions from both the outside and from within the music industry itself. But with TVXQ’s official comeback stage on KBS’s “Music Bank” yesterday, there has been an additional influx of celebrity support for the boys. Recently, SHINee’s Minho and Onew expressed their support for their senior labelmates after watching their return on stage. 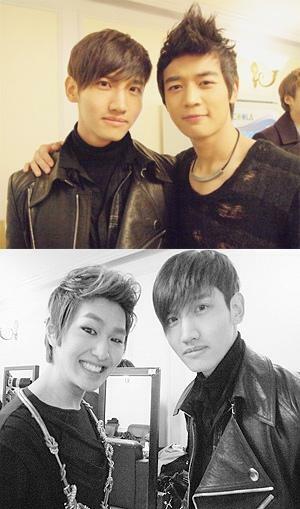 Both Minho and Onew posted photos they took with Changmin onto SHINee’s me2day account, which were attached with a bright message from both the boys. At least the words of Minho and Onew aren’t harsh unlike their other SME labelmates. Sunbaes are usually the role models for their hoobaes but in this case, it looks like Minho and Onew’s “respected” sunbaes should learn from them how to properly cheer and support their labelmates without bashing and bringing down other people. On January 2 at 4PM in the Seoul Jamsil Olympic Stadium, SHINee held their first individual concert ‘SHINee World.’ At the press conference before the concert was held, SHINee expressed their deepest gratitude towards their seniors, TVXQ and SNSD, who have given them so much support. This is a fan account by a SHINee fan, but it’s completely relevant because it’s mainly about HoMin and Cassiopeia. Knowing that the kids have a hyung like that makes me really happy and completely content. Everything that Yunho endured as the leader of TVXQ, he’s spoken to Onew about. He’s taught him so much, yes, he’s always trying his best to help Onew become an even greater leader than he is. At the same time, he also knows about the burdens and responsibilities he has to shoulder as a leader, and that is why, compared to the 4 other members, he is especially kind to Onew. Only because he knows too well how difficult it is to be in that position and how important it is to show him love and support. Onew, being younger and softer than Yunho needs extra love and protection. This hyung has put so much effort into protection our kids, in the hope that his personal experience will help get them further and make them a better group. This is why, last night, when I saw a tired, quiet and expressionless Yunho exchanging glances with the 5 members; when I saw Onew by his side, Taemin putting his arm around his waist, Minho tugging him along and Jonghyun and Key walking past him over and over again to help cheer him up, I felt content and proud. Huuhuu, I don’t know whether it’s because I’m too much like a mother, everytime I see the SHINee members showing love for their hyung, I feel a rush of pride. They’re kids who really know the meaning of being grateful. Hyung’s time and love hadn’t been wasted, it’s no wonder he likes you all so much. Yesterday, in the hearts of Cassiopeia who had been waiting for over a year by now, there was bitterness and pain, but more than that, they were proud. Anyone who sees them would be in awe by the love and devotion they’ve shown towards their idols. Of course, this is because their idols really have made themselves worthwhile of their sacrifices, yet what amazed me most was that whether it be this year’s Dream Concert or last night’s SMTown concert, Cassiopeia gave TVXQ the same red ocean. Last night, when the big screen started to pay the VCR of HoMin, most of the fanlights had been switched off and I was almost a little shocked. However, in less than a minute, when HoMin descended from above, the stadium which had previously been a sea of various different colours completely transformed in to a red ocean. This kind of scene, whether you’re a Cassiopeia or not, it really leaves people completely awestruck or even in tears. I saw lots of Cassiopeia noonas holding onto each other as tears poured out of their eyes. So many of them continued to wave their glow sticks and fan signs even as they were overcome with emotion. That night, I should’ve been really happy because SHINee really delivered an amazing performance, they were so adorable and they had such a great time. Yet as I sat amidst the Cassiopeia noonas, I really couldn’t help myself from screaming and crying with them. When HoMin’s performance ended, they really lost control. If the tears from before had been the result of a year’s worth of waiting, of pain, of controversy and of happiness over HoMin’s return, then this time, it was simply because they’d lost it. They were in so much pain that they had all completely broken down. We’ve never heard the two talk about the pain and torment they’ve endured over the past year, yet we all understand, and that is why so many fans from all over the world have come to support them. In the end, the Yunho fans who were sitting next to me were still mumbling ‘what to do what to do, (we) really want to go to the US, to China, to Japan, even if it’s only for 6 minutes, 6 minutes is better than nothing, (we) have to go with him.’ Some also said that seeing the fans with Bigeast towels who’d come all the way from Japan really hurt them more than anything. At the end of the concert, some of the Yunho fans came over to us Shawols and ELFs and bowed as they thanked us. Eventually, we all started crying with them, aish. When I got home, I really wanted to see how the fans from China had reacted, of course, everyone was shocked and angry at first, but people slowly started to comfort one another, and I saw lots of words of encouragement from the fans. I was so touched! ‘We’ll treat it as though the purpose of their appearance was not to dance or to sing, but simply to see those who’ve missed them and to tell us that they’re still protecting TVXQ, it’s completely worthwhile.’ ‘Even though it only lasted 6 minutes and we waited 7 long hours, as long as we’re able to catch a glimpse of them and see that they’re well, it’s enough.’ There were lots of messages like that, and each and every single one of them touched me. All of a sudden, I remembered a conversation I’d had with a Yunho fan last night. I asked her why she loved Yunho so much and whether it was hard or tiresome for her. She replied ‘I do get tired, of course I get tired, I get tired, bitter and angry. He really is a a fool, but there’s really nothing we can do, we’ll stay by his side and help him through the hard times because compared to everything he’s been through, our suffering and our exhaustion is nothing.’ After last night, I suddenly had a newfound love for these noona fans, I really really like them, they’re definitely the most lovable fans I’ve ever seen. Thinking about how good the oppas are to our SHINee and how nice the Cassiopeia noonas are to us, I really hope that one day, SHINee World will become just like Cassiopeia, so that our boys will be proud of us as well. YunHo and SHINee gathered together to donate to children who are in need living in war zone areas. SHINee and YunHo will attend the DMZ National Documentary Film Festival on the 31st to assist with the donation. The film festival held on the 9th of September will also be towards assisting those in need living in war zones. The donations will go towards funding their basic needs such as water, food and clothing. The event will begin on the 31st at 3PM with YunHo and SHINee directly giving donations.